Finding the right dog crate isn’t always easy. There are so many options available! Don’t worry. If you want to find the best dog kennel but aren’t sure where to begin, check out our best dog kennel review. We did a lot of research to make sure we found ten of the best options for you. Before we get started, let’s take a look at some important features you need to know when shopping for a dog crate. Doors: Our top picks have anywhere from 1 to 3 doors. 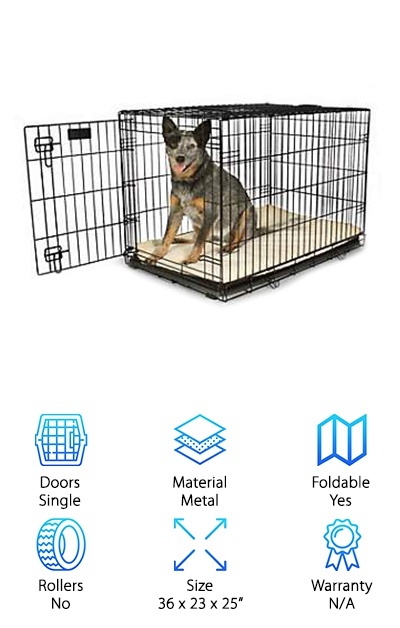 The more doors there are, the easier your dog can access the crate. Plus, it leaves the space a little more open when your pup is just hanging out. Material: Most of the kennels we chose are made of steel that’s been treated with some kind of protective coating. There are a few hard plastic ones, too, that are made for travel. Choose the material that suits your needs best. 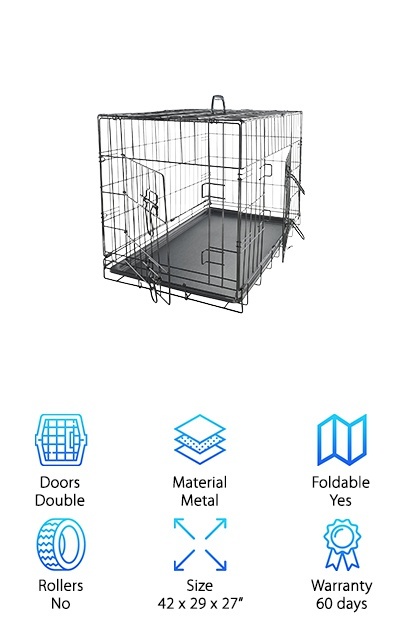 Foldable: If you want to be able to hide your dog’s crate away sometimes or take it with you on a road trip, getting a foldable one is the only way to go. It’s usually always easy and tool free! Rollers: There aren’t many options with rollers, but we did find a few. They’re great for travel but also nice to have in your home. Not only do they make it easy to move the crate, they also prevent floor scuffs. Size: The bigger the dog, the larger the crate. Travel crates are pretty compact so your dog won’t have a lot of room to move around. Crates to keep at home, though, should allow a little bit of wiggle room. Warranty - A long warranty is better than a short one but, regardless of length, make sure you read the one for your kennel. Know what’s covered and what isn’t. Warranties on travel crates are especially important to read up on! Now that you know more about dog kennels and what to look for to find the right one, let’s get right into our reviews. If you’re in a hurry, spend a little time reading about our top pick and budget pick first to get an idea of what’s out there. Then, read on to find out about the other amazing products we chose to round out our top ten list. All right, let’s get right to it. 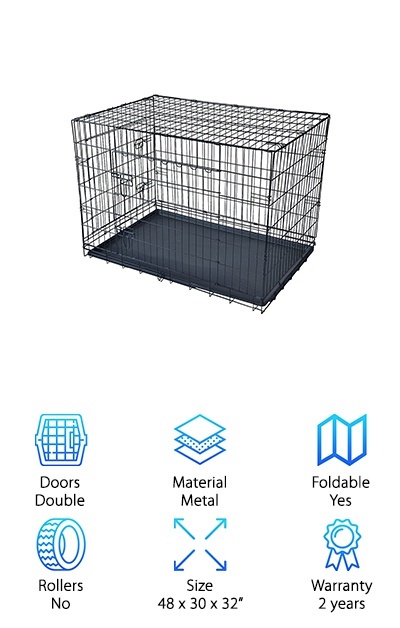 The Midwest iCrate is our pick for best dog crate for large dogs but thanks to the included divider panel, it’d be a good fit for smaller dogs, too. It folds flat for easy transport and even has a strong handle for carrying it. After you get it set up, there’s no need to worry about your floors. First of all, the plastic pan is leak proof so your floor is safe from any accidents. Plus, it’s equipped with rubber roller feet to help avoid scratches. There are 2 doors, each has two slide bolt latches so your dog will be safe inside when you’re not around. And get this: they even rounded off the corners so there’s less chance your dog will get poked by a sharp edge. Our budget choice is also the best soft dog crate for small dogs up to 25 pounds. (You can even put a cat or 2 in here if you’re a cat person.) There are 3 doors to this crate. Basically, if you leave them all open, your dog will be able to go in and out as they please. It makes a nice, den-like space for them. Once you close the sides, though, your small dog will be secure while knowing he’ll be comfortable. The entries can be covered with a zip mesh window that allows for good ventilation. This one is so suited for travel because it collapses. Take it with you on the road then set up your dog’s little home when you get to your destination. 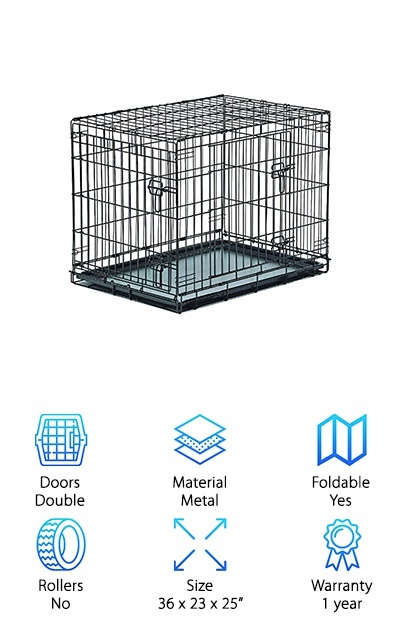 Here’s another great option if you’re looking for the best dog crate for large dogs. One of the things that stood out about this one is how easy it was to set up and take down. Why is this important? Easy! Who wants to keep folding up a crate for storage if it’s too hard to get it set up again? It’s made from steel wire that’s been formed into mesh. The mesh is then formed into the crate, making it durable and long lasting. Each door has a sturdy bolt lock and the whole thing is covered in an Electro-coat finish. Even in harsh climates, these crates are rust, corrosion, and fade resistant. Plus, the plastic tray is easy to clean. You can remove and replace it without having to open the crate door. If you have a big dog, you have to check out this dog kennel from BestPet. It sets up and collapses easily in mere seconds, no tool needed. There are 2 doors on this crate. Each one has 2 latches on it to keep your dog safe and secure inside of it when you aren’t around. 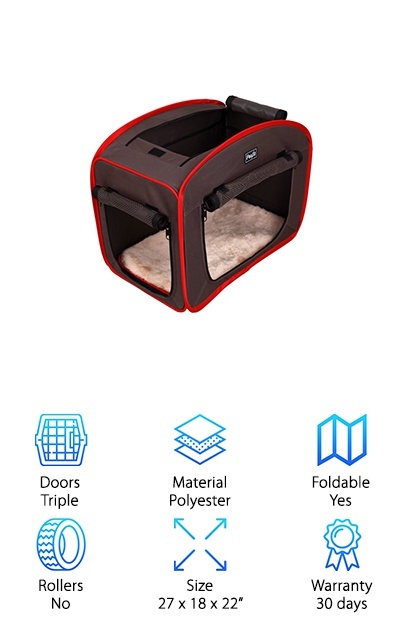 It comes with a divider so you could use it with smaller dogs if you wanted to. The metal is covered in black epoxy that prevents rusting and makes the crate more durable in general. Of course, the fact that the crate is made of all-steel high strength wire that’s been welded into mesh certainly helps give it a lot of strength, too. Set up is easy and here’s the best part: it folds completely flat for easy storage. There is so much to love about the EliteField Soft Dog Crate. Its simple steel tube frame is covered with hexagon mesh fabric making it really lightweight and easy to clean. One thing we really liked about this one is how tall it is. It gives your little dog much more headroom. The crate has plenty of mesh doors and windows for ventilation and easy access. And that’s not all. This one also comes with a carrying bag and a fleece bed. Set your pup up to be nice and comfy as soon as you open the box! This is a great one for travel, too. It collapses to only 3 inches high and can be comfortably carried with the adjustable shoulder strap. And here’s the kicker: it comes in 13 different colors. 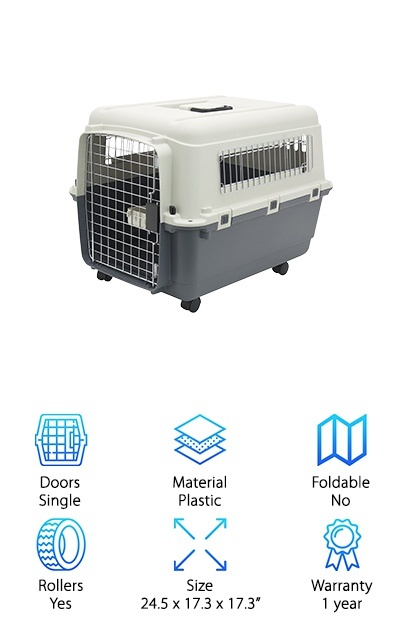 Our pick for best plastic dog crate has a lot of great things about it but our favorite is probably how well designed it is for airplane travel. For starters, it’s approved by the International Air Transport Association. It also includes a water dish and 4 “Live Animal” stickers for when you’re traveling. Plus, there are tie down holes that are required by airlines for safe travel. Of course, this is a great kennel even if you’re not traveling. It sturdy, durable, and even has wheels that snap on when you need them. You pup will also get plenty of ventilation, too, whether on a plane or sitting in your backyard. And don’t worry about your pup chewing through the plastic. They use metal slats around the openings to prevent this. If you’re waiting for the best outdoor dog kennel, here it is! 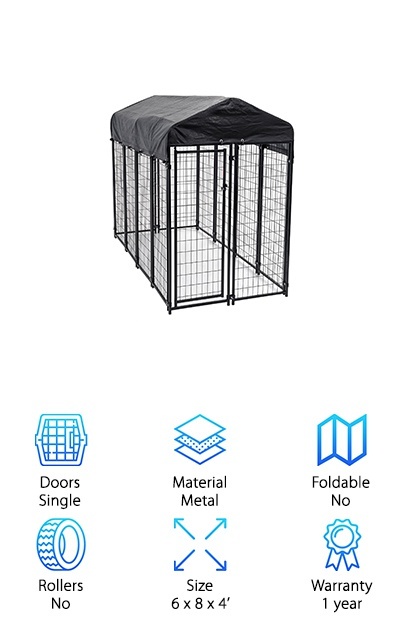 The Lucky Dog Uptown Welded Wire Kennel is great for outdoor residential or commercial use and a great large dog kennel. The frame is made of steel bars and wire mesh welded together, then coated to protect against rust and corrosion. It gives your dog a lot of space, especially when it comes to headroom. And get this - it also comes with a waterproof cover. Keep your dog dry in light rain and shade him from the harsh sun with this cover and the sturdy roof frame. The roof is even pitched so water, debris, and snow slide right off instead of collecting and causing potential problems with leaks. Plus, the 1.5 inch raised legs let you easily remove debris. This crate from Petco might be simple, but it still has a lot of really awesome features that we had to pick it for our list. For one thing, it comes completely assembled. All you have to do is quickly get it set up. You also get a divider panel with this one so you can adjust the size of the crate. All of the metal is covered with a baked powder coat finish to protect it against corrosion and rust. It comes with a manual that teaches you how to crate train your dog. That way, you’ll know he’s okay when you’re not home. That’s not all. There’s a plastic pan that slides out for easy cleaning. This is a great choice for home use and folds up quickly and easily for travel. 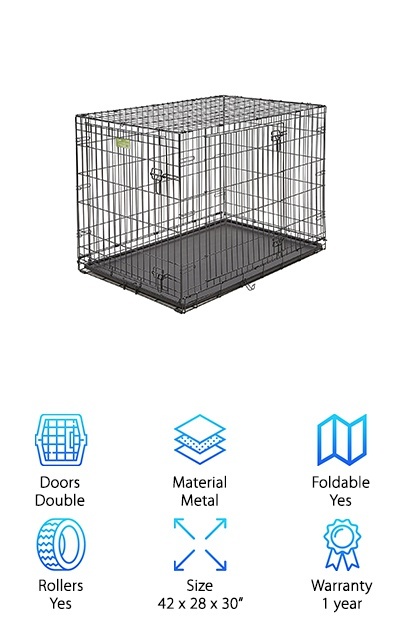 If you need a crate for airplane travel, this Ruff Maxx Portable Dog Kennel is a great choice. It has a durable plastic shell and comes with everything you need to assemble it. You don’t need to worry about whether or not your pup is getting enough air. There is plenty of ventilation around the top section of the crate. Plus, the door is made of steel wire that also lets in plenty of air. The door also has a squeeze latch and barriers to add some strength so your dog will stay safe and secure, even if he’s an escape artist. Although this crate meets most airline requirements and even those of the IATA, it’s always important to check before you travel, just in case. One more thing: it’s made in the USA. New World Crates are loaded with features. This one is made to hold medium sized breeds and is really easy to assemble. You don’t even need any tools. 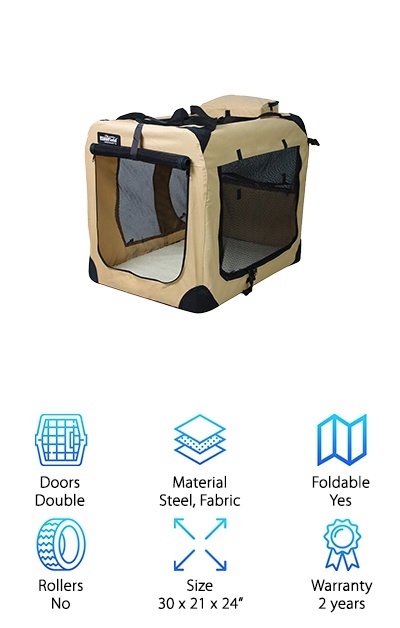 It has double doors, each with 2 heavy duty slide-bolt latches to keep your dog safe and secure when you’re not there with him. They swing open and have low thresholds so your pup will have no problem getting in and out. That’s not all. 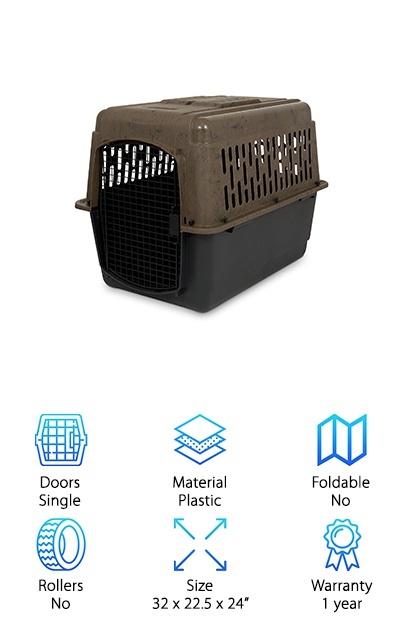 This best heavy duty dog crate collapses until it’s perfectly flat which makes it ideal for travel and easy to store in your home. The plastic pan is easy to remove and clean. It actually has a hook called a Pan Stop to keep it in place until you’re ready to take it out for cleaning.